Others have made the important point that the critical word in the phrase “Software as a Service” (SaaS) is “Service” not “Software”. Taking this a stage further, I believe that the traditional distinction between a company’s “Product” and the stuff that surrounds it needs to be completely eliminated. In my view, this distinction is a hangover from the bygone days of software companies selling boxed software products. In contrast, if you’re a SaaS company, you’re truly in the service business, not the software business, so your view of what constitutes your “product” has to evolve. 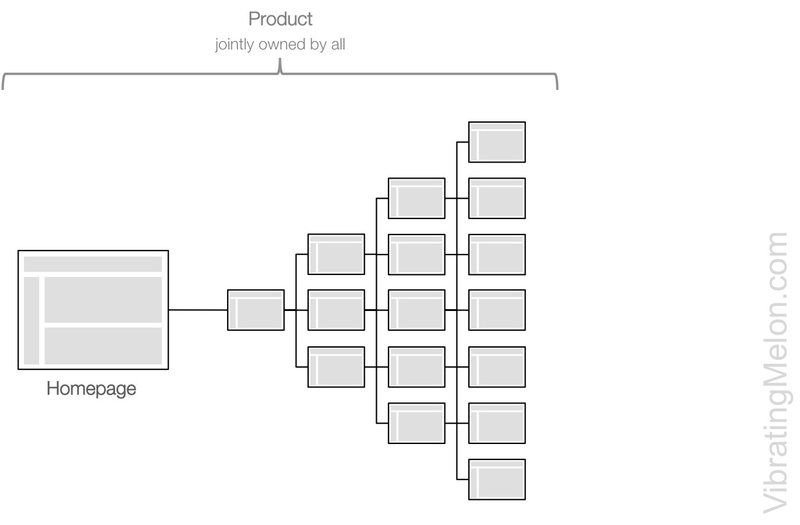 the “Product” – this is the functionality that delivers on the company’s value proposition. The “Product” is built by the development team and actively worked on. For online software (i.e. most software these days), the “Product” is generally everything that’s behind the log-in stage. “Marketing Material” – this is generally static content including the homepage and those other pages that are linked to from it. It describes product features, benefits, case studies, etc. “Sales” – unless your company relies solely on self-signups, these are people responsible for getting customers to pay for your product. In contrast, the job of development is to create what people get after they’ve paid. The Product does not directly help with “sales”, except in the obvious sense that it’s the promise made of what you’ll get when you pay and you might be allowed a free demo beforehand. the “Funnel” – in most companies, there is typically the notion of a funnel – i.e. that series of steps that a person has to go through from first contact with your company to becoming a customer, be they on your website or on the phone with a sales rep. There may be people focused on increasing the conversion rate through your funnel (i.e. the % of people that end up being customers after first contact) and these people may even be active planning to reduce friction at each stage of the funnel. 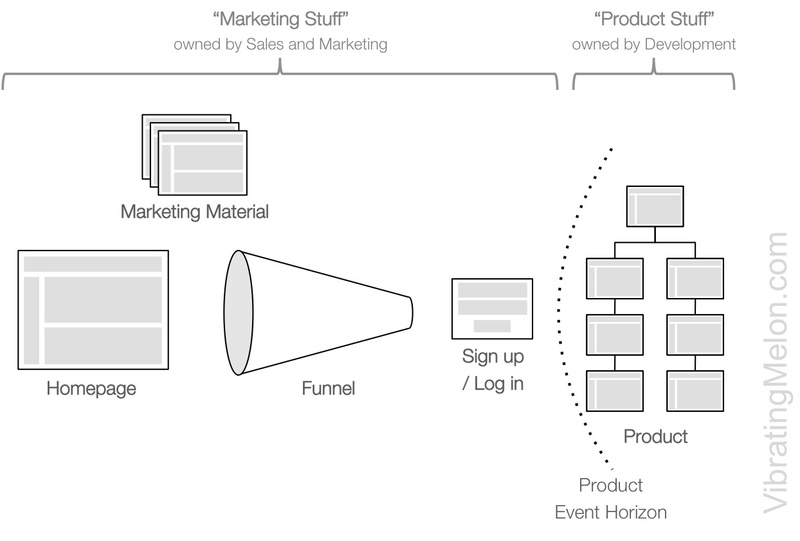 However, the “Funnel” is generally still thought of as “marketing stuff” – not part of the “Product”. After an initial launch, the rush is then on to keep evolving the product and keep delivering on a roadmap of features. The development team thinks its job starts after the user is signed up and signed in and that its role is to give the user more and better stuff for their usage / money. In contrast, the “marketing material” quickly becomes the poor step-child of the product and becomes stale as it increasingly gets out of sync with the product over time. This happens for a few reasons: partly because no one inside your company ever looks at it (out of sight, out of mind), partly because the marketing team is much smaller than the development team so there is little bandwidth for content changes and, often, because changing the static content is hard (it often requires involvement of developers who see it as busy work). As for the Funnel; it may be actively measured by marketing and sales people. Also, noble efforts may be made to improve conversion each step along the way but the Funnel is still “marketing stuff” in the eyes of the development team and large scale changes to it are hard to make happen since the Funnel is not part of the “Product”. Unfortunately, if you are in the shoes of a potential customer, it’s the marketing material you usually see first and which forms your first impression. You can lose huge numbers of potential customers on their first touch with your company if your marketing content is weak. Inside your company, marketing and sales realize that first. Development often doesn’t realize it or does and doesn’t care. This creates tension and all the required ingredients for a text-book “marketing versus development” internal feud seen in so many software companies. 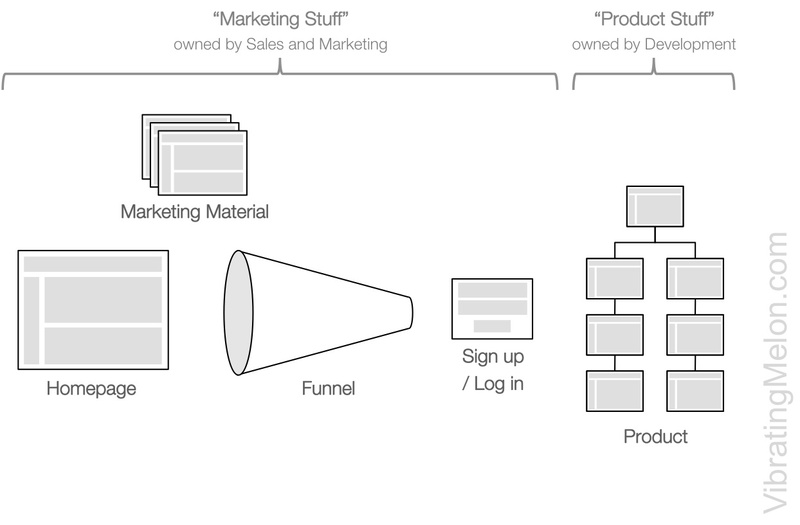 The solution is to abandon the notion of “marketing stuff” vs “product”. In this view, everything that a potential user sees is now your “product” and should be continually improved and finessed, starting from the stuff the potential user touches first – typically your homepage. Because everything is now the “product”, development now owns it too. For a lot of people, this is a pretty fundamental change so don’t expect to be able to make it over night. It’s about seeing your product from an outside-in perspective, rather than an inside-out perspective. Making this change requires joined-up thinking. As soon as someone has a slightest touch with your company, your product needs to act like a tractor-beam and gradually draw that person deeper and deeper in. The product needs to progressively reveal more and more benefits and features and get the person to start using it without even realizing they are. This is the “unconscious adoption of a product”. Think of it as seducing your user. At a certain point, the user crosses what I call the Product Event Horizon. 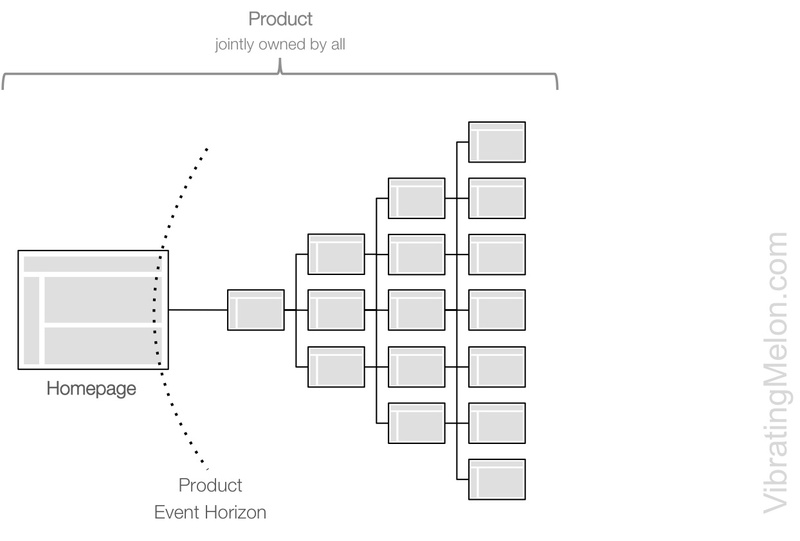 The Product Event Horizon is an invisible line that users hopefully won’t realize they’ve crossed but which they can never pass back across again. Your company’s job is to push the Product Event Horizon out as close to possible to the first touch with your potential user and to make passing over it as unnoticeable as possible. i.e. people start using your product without even realizing they are and before they can stop, they’re hooked. To use a more plebeian analogy, the Pringles slogan had it right – “once you pop, you can’t stop”. Everyone in your company should understand the series of stages that a potential user goes through from first touch with your company to being an active user and/or paying customer. More specifically, make sure everyone understands the conversion rate at each stage of the funnel – i.e. what people % of people advance to the next stage rather than drop off. As the saying goes, you can’t manage what you can’t measure. More specifically, you don’t know what changes help if you can’t measure their effects. Another issue here is that SaaS companies are usually dominated by engineers and engineers generally hate “marketing stuff”. They argue endlessly with sales and marketing over what’s important in the product. However, engineers are generally suckers for facts and the scientific method. If you show them actual data showing what users click on, how they make there way through the product from their first touch and where they drop off, there’ll be much less argument over what’s important to fix. An important step in the joined-up thinking and elimination of the distinction between “product” and “marketing stuff” is the ability to track a user all the way through from their first touch to their ongoing use of your product over time. Don’t let data about conversion rates through your funnel stay separated or get separated from data about usage of your product. A good Content Management System (CMS) will allow tweaks to the text, images, videos and, to some extent, layout, throughout your site without having to dive into raw HTML or source control. This significantly decreases the time to make such changes and increases the number of people who are able to make them. In turn, this means they can be tweaked much more frequently. Importantly, don’t fall into the trap of only using a CMS for the “marketing stuff” and not for the “product”. It should be easy to tweak language and layout throughout your whole site. A-B testing is a habit you have to get into, rather like test-driven development. A-B testing lets you answer the question scientifically as to whether a change you make has a positive benefit. One note of caution is that A-B testing can only be effective once you have a certain volume of hits/users – you need enough volume in order for the comparison to be statistically significant. Premature A-B testing is a form of premature optimization that can hinder rather than help. A-B test with too few hits/users and you’re trying to read tea-leaves, rather than apply the scientific method. Fortunately, good A-B testing tools also let you know when you have enough data for the comparison to be statistically significant. This is the meeting where you review the data on how your company is performing. It’s the meeting that engages everyone in driving the company by the numbers. Ideally, have this meeting weekly. In a small company, make it an all-hands meeting. In bigger companies, make sure that there are representatives from all areas including, importantly, actual developers. Make sure that no one can stick their head in the sand and get disconnected from the reality of your business. Make it the most important meeting of the week. It’s the heartbeat of your company. The raw inputs are all that data you are collecting through the approaches above – funnel conversion rates, hits, click-tracking, A-B testing results, etc. However, identify a small number – some say less than 10, others say only 1 – of metrics that you focus as the true indicators of how your business is doing. You can dive into others as required. Try to review too many data points and you can’t see the wood for the trees, the meeting drags on and people start to think of it as a chore. Or, because these people are hard to find and are highly prized, convince someone internal to become your marketing engineer. Marketing engineers bridge the gap between the marketing activities and software engineering – they live and breathe meta-data, tags, SEO, viral co-efficients and conversion rates. On the face of it, developers should naturally gravitate towards this work since it’s hard, involves tinkering and is data-driven. However, many developers still shy away from it because it smells of “marketing stuff”.